For me, I see Kickstarter as both a blessing and a curse. It’s great because you find out about new games you don’t see in stores, and it’s bad because you find out about new games you want to buy. Back in Feb 2014, I was with a gaming buddy of mine looking at a new Skirmish game called Arcworlde. I had avoided Kickstarter up to that point as most of the games being touted were by big companies who had the money to bring out the game. To me it felt like a pre-order system which I didn’t like as it wasn’t what I thought Kickstarter was all about. But Arcworlde by Alex Huntley, was different. Here was a guy sculpting his own models that looked rustic with lots of character; he was doing the rules, and in fact he was doing a lot to try and get this little game off the ground and onto the game tables. So I broke my Kickstarter block and jumped on board, and I have to say I wasn’t sorry I did. Arcworlde is a medieval fantasy world populated by Humans, Orcs, Goblins, Undead, Halflings, Elves and all manner of monsters willing to bite a man in half just because. Forces are moving across the world trying to keep what was theirs, and also take a bit of land from someone else, all while searching for Arcanite, a powerful substance that powers magic. Each race, as in all games, has a bit of character and something about them that really draws the eye to the models…be it the Albionnicans in their smart Uniforms with shiny swords, or the Bayourks in their dungarees and straw hats. As a player, you’ll play one or more forces as we all buy extras, and try to pit your skills against your opponent. The rules, in essence, are pretty simple to learn for the most part, though there are a couple of extra elements that take a while to fully comprehend. Most things are a success on a 4+ on a D6. This value can be modified up or down by various factors in the game. Each fighter has unique skills or attacks that can also affect how good or bad they are at fighting. The stats of a model are kept simple as well: Move, Defence, Cowardice, Wounds, Block and attacks. Each model also has action points and each attack they do will cost a certain amount of points, as do other actions like walking, running, climbing etc. When a model runs out of action points his turn is over and you move onto the next model. Combat tends to be pretty easy. You roll the amount of dice required by the attack you’re using. How easy you hit could be modified by your opponents defence value and the skill of the attack being used. Your opponent rolls his Block skill which is modified by the power of the attack and his block skill. Each successful attack will do the amount of damage listed reduced by any armour they have. Special results can ignore armour or even break it, making a person susceptible to future attacks. All in all it’s pretty easy to play. The two things that will take a little bit of work are the Epic Duels, which are huge combats between two people that take place in an out of play sequence. Beyond the dice you’ll also need a standard deck of cards to do an Epic Dual. As mentioned before, each force is unique and full of character. The Albionnicans are a solid force that are built around the hordes of Halberdiers and crossbowmen. Added to this are Knights and the Ogre that looks amazing. The Wild Elves of Caledon bring a fast moving and brutal force to the table with the ability to summon troops into the game just when you don’t need them. 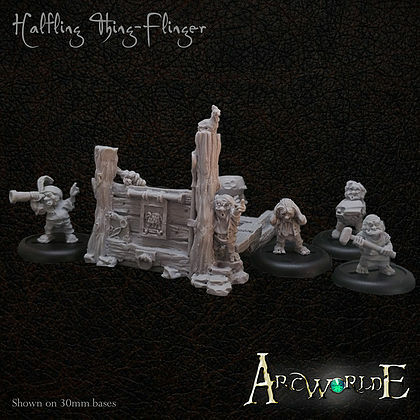 Halflings are much like the Albionnicans, solid troops of Militia and Bowmen helped out by the Town Guard and Thing Flinger. What really sets the game apart and gives it some mix, is the ability to take some great monsters to supplement your force… the nasty Arcanid with the Elves or Death Kiwi’s with Goblins. These unpredictable troops can really make the game fun even if you’re laughing at your own monster eating your own forces. The book is very well done and contains artwork of the various game elements, and is finished off with all of the stuff you need. If you’re interested in the game and just want a look, you can download the rules for free from the Warploque website. For me, nothing at the moment. Okay it doesn’t have a campaign system, but I don’t see that as being a reason not to buy it. Lots of games don’t have those sort of things from the start, so it’s not a problem at all. A few more profiles would be good, but Battle of Troll Bridge has done that and the new Kickstarter in September will no doubt add a few more. So all in all, it has more than enough elements to you started. 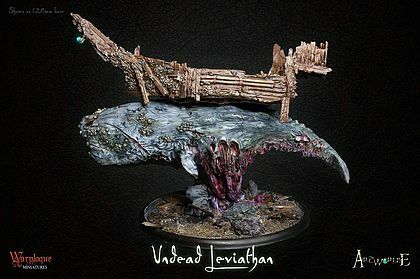 Where can I find more info on the undead leviathan (the last pic of your article)? Oh, I must have missed it’s entry in the book. Its a sweet looking model indeed.